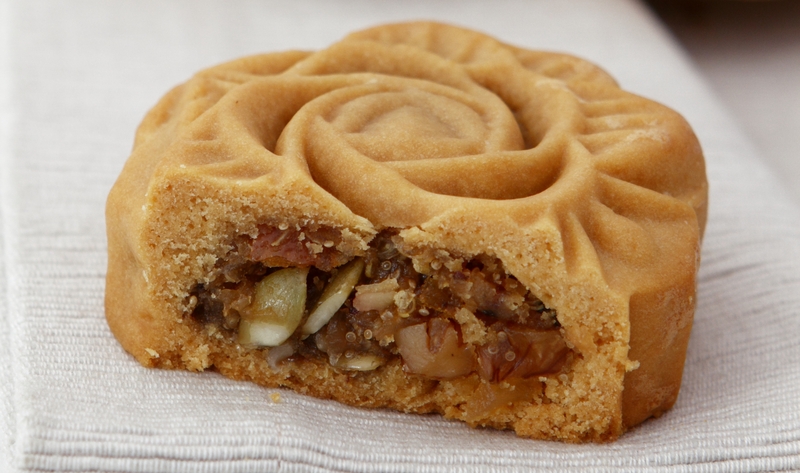 THIS mooncake utilises healthy grains and nuts, making it a much healthier alternative to the mooncakes sold by stores. This recipe was first published in Flavours magazine. Combine the golden syrup, oil and lye water. Cover with cling film and leave to stand for 1 hour. Sift in the flour and mix to form a soft, sticky dough. Cover with cling film and leave to rest for 1 hour. If the dough is still sticky, add a little more flour. Divide the dough into 70g portions. In a mixing bowl, combine salt, peanut oil and golden syrup. Slowly mix in the remaining ingredients and stir until combined. Divide the mixture into 90g portions for a thin crust and 70 g portions for thicker crust. Take a portion of dough and roll it out. Wrap it around a portion of filling. Pick out a few flowers and discard its stem, if any. Press the flowers onto the skin of the mooncake. Dust some flour into the mooncake mould and knock out the access flour. Press the filled dough into the mould. Knock out the mooncake and arrange it onto a greased tray. Place into an oven pre-heated at 180°C and bake for 10 minutes. Remove from oven and brush the mooncakes with a thin layer of egg wash. Return it into the oven and bake for another 10 minutes. Remove from heat and leave to cool before storing. Best served after 3 days and eaten within 10 days. This recipe also calls for a mooncake mould to give the mooncakes their shape. Cendol Quinoa Mooncake with Jelly Egg Yolk. Millet, Orange and Red Bean Animal Biscuits. Flaky Skin Mixed Grains, Seeds and Nuts Mooncake.